We love our dogs, admit it. We treat them like our children, baby talk and all. So, why wouldn’t we want them to be part of the biggest day of our lives? 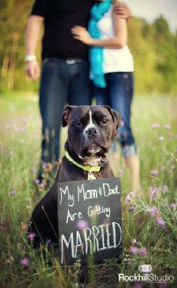 From the “save-the-date” to the ceremony, we are having our dogs included in our wedding day. Check put this “save-the-date”. The faces of the bride-to-be and groom-to-be aren’t even shown. And yes, I do too refer to my husband as “Dad” when talking to our dog. And if you think flowers are only for the bridal party and centerpieces, you need to think again. In the event that you don’t have a darling nephew to be your ring bearer don’t discount “man’s best friend.” You can bet that having your favorite pooch as you ring bearer will get far more “oohs and aahs” than that cute little nephew of yours. 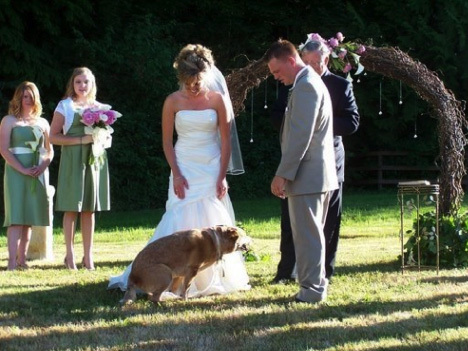 Your pet’s temperament – can your pet handle all the adoration and attention of your wedding guests? 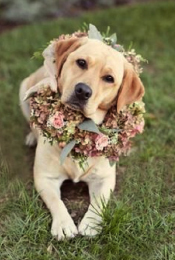 Are any of the flowers that would be used in your wedding potentially toxic to your pet? You will need to notify your guests as a warning to anyone who may be allergic to your pet. Let your photographer know so you can collaborate for some fun photo sessions. 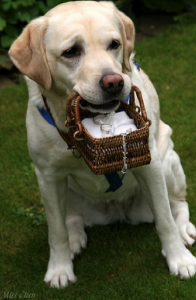 Lastly, make sure you book a pet sitter to be responsible for bringing your pet to the wedding, taking your pet home after the ceremony, and most importantly, to make sure he or she does his or her “business” prior to the ceremony. This is not a good look for the wedding album!